When we think of health and fitness, we usually think about being active, having a good diet and a healthy lifestyle. What about stress; sometimes is an obvious part of daily life. Being a strong independent business woman can be stressful. Is it possible to be successful without being stressed? I want to introduce two beautiful and incredible sisters Alison and Katherine Wilson, Islanders both, born and raised on the Vineyard. One thought success meant leaving and embracing corporate America, the other followed her heart, and in the end both landed at the same incredible destination. She learned early on in life that each decision she made, would have great impact on her future. So instead of rushing off to a four year college, she decided to trust her instincts and began to travel the world, exploring what life had to offer. All the while; massage therapy was always in the back of her mind. Upon returning home she did her research, and found the right massage school for her; The Costa Rica School of Massage Therapy (CRSMT), in the jungle and on a beautiful beach in Costa Rica. She immediately applied; and after saving enough money working on-Island as a gardener, off to Costa Rica she went. It was two years after graduating that she ended up back at CRSMT, this time as a teacher. She taught a number of bodywork courses there, and also back in the U.S. at the Berkana Institute of Massage Therapy in Colorado. Deciding that Martha’s Vineyard was truly her home, she deepened her roots, and started her own business. Specializing in therapeutic massage, and now teaching yoga as well. 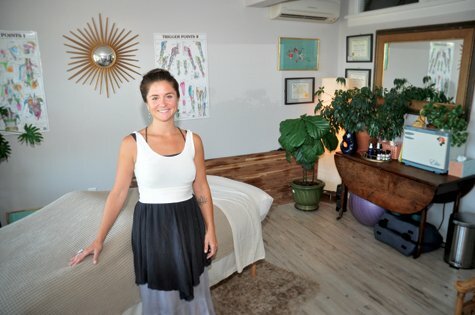 Katherine is always learning new techniques and discovering various modalities to incorporate into her thriving practice. All with the intention to better support her clients needs. From her second floor studio blissfully overlooking the Lagoon pond in The Tisbury Marketplace she happily continues to cultivate her craft, and expand her practice.